Albert Honey (born at Sunningwell in 1895 and baptised at St Leonard’s Church on 30 June; died age 4, buried in the churchyard on 28 February 1900). James’s father was a brickmaker, and their first child was born in Wootton in 1873. They evidently went up to Yorkshire before the birth of their second child in 1875, but were back in Wootton by 1878. The 1881 census shows them living in Wootton with their first four children at Old Pounds; but by the time of James’s baptism in 1883 they were living at White Cross. By the end of 1888 they had moved from Wootton to Sunningwell, and by 1890 they had moved to Sunningwell and were sending their children to the school there. The 1891 census shows them living at 18 Sunningwell Road; James’s sister Sarah (12) had already left home and was a servant at the farm of Dennis Deane in Sunningwell Road. When Elsie was baptised at Sunningwell Church in 1893, James’s father was described in the register as Deputy Parish Clerk. James himself became a bell-ringer at the church. At the time of the 1901 census the family was still living at 18 Sunningwell Road, and James’s father was working as a roadman. James himself, now 18, was not at home, and shortly after the census, on 24 May 1901, he joined the Royal Garrison Artillery. Constance Naomi Honey (born on 6 August 1916 and baptised on 8 October 1916). 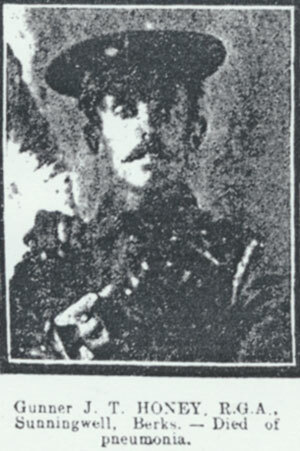 James must have left the army for a period after his marriage, as he is described as a labourer at the baptism of his first two daughters; but he was back in the army by October 1916. From 1916 James’s father is listed in Kelly’s Directory as Sunningwell’s deputy clerk and sexton. In the First World War James Thomas Honey served as a Gunner in the 109th Heavy Battery of the Royal Garrison Artillery (Service No. 280698). He died of pneumonia in France at the age of 35 on 15 November 1918. He was buried in the Terlincthun British Cemetery (Grave XI. A. 31), and his family paid for the inscription BE THOU FAITHFUL UNTO DEATH AND I WILL GIVE THEE A CROWN OF LIFE to be added to his headstone. 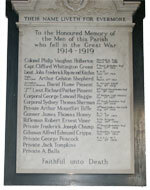 He is remembered on the war memorial at St Leonard’s Church in Sunningwell. G. Honey and J. Honey appear on the “Those who Served” list in Sunningwell village hall. These are probably James’s brothers George (born 1888) and Jonathan (born 1880). Mary Ann Honey (Mrs James Honey) died at 20 Oxford Road, Abingdon at the age of 69 and was buried at Sunningwell Church on 29 August 1922. Edith Bessie Honey (Mrs James Thomas Honey) (born 1885) was living at 50 Bayworth in Sunningwell after the war. She died in 1970 in the Abingdon registration district. Elsie May Honey (born 1913) married Frank Butler in 1935. Constance Naomi Honey (b. 1916) did not marry. She died in 1992 at the age of 85 in the Abingdon registration district.